Calvin is the single greatest non-Phase2 developer I've worked with in the last 5 years. 16 - Does everyone's computer lab homework. Sent to principle's office ... to solve computer problems. 19 - Computer Engineering or Theatre School...? 20s Part 2 - Design and Webdev for self and entertainer friends. Loves long walks on the beach, forest hikes, motorcycle rides, stories in all forms, and big ideas! Building Cool Software -- Creating Stories -- With Amazing People. Calvin has over 10 years of experience with Drupal and Enterprise Drupal Projects! 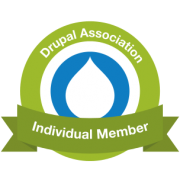 For Drupal consultation or to add a senior developer to your project, reach out on LinkedIn for rates and availability. Calvin has strong technical and communication skills, and a good mind for systems and processes. He's creative and has more ideas than he knows what to do with. Do great things together! He loves to support or lead a team! Platforms and Applications: Web and iOS. Arts and Entertainment: theatre, film, writing, game dev. Real Estate: Investment and property management.